Eat all cheeses you can before the lions catch you!. Action game with great 3D graphics. 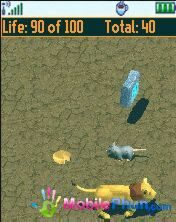 10 levels full of cheeses, lions and fun! Compatible with MIDP 2.0 and CLDC 1.0.